There has been a lot of Tack Room break ins over the last few weeks, with thousands of pounds worth of tack and equipment being stolen. So what can we do to help stop ourselves being the victims of theft? First of all you need to look at your security measures, now this can be hard, especially as many of us are on Livery Yards and therefore have no control over what measures can be put in place. The fact that tack rooms are used by many people also increases the risk of human error and doors being left open or unlocked and also alarms etc not set, also with a busy tack room on a big yard people may not question anyone who goes in as they just assume they are authorised to be there. However having a lot of people using it is also a deterrent as it means there are less periods of time when no one is about and it also helps stop routines being set, as people turn up at all times. With all security it needs to be seen as a deterrent – not a complete solution that 100% stops all theft. When looking at what measures you can put in place always start from the inside, with the items you are trying to protect. Then work your way out adding in layers of security (protection) . The other constraint on Security is budget, here we will look at some options for you that hopefully cover all budgets. Over at Equine Security they have designed a High Security Tack Safe called the Tackguard, which is a small strong room designed to protect your tack. They start at around £1100 and are bolted to the floor of your tack room. They hold up to 3 saddles each and can be built to your specification. These are perfect if you are on a livery yard and unable to put other security measures in place. They are at the higher end of the budget, but may be a worthwhile investment if you have hard to replace tack. Tack lockers are another very good investment. They work very well in a shared tackroom where you want to be able to securely store your equipment without other tack room users having access to it. Bear in mind that in order for the tack locker to protect your tack fully from theft it will need to be attached to the fabric of the building or bolted to the floor. Otherwise it can easily be wheeled or carried onto a truck and taken away, giving the thieves plenty of time to work on cutting open the locker without needing to bring tools etc to the yard. Easy to use, saddle can be secured in seconds. • Highly visual yellow powder coating. • Wall bracket is manufactured from 30mm x 12mm steel. allows screws to be inserted. Undoing these screws with a screwdriver is not possible. Stubbs England do a lockable saddle rack that attaches to the wall and works in the same way as a conventional one, but has a metal bracket that comes down over the saddle and is locked into place when not in use. If you are using the Stubbs England one you will need to provide your own padlock, so ensure you get a high quality security padlock, Asser and Abloy are good makes to look for, however your local locksmith will be able to advise you too. If you are going to use one of these saddle racks, make sure it is being attached directly to the wall, as if it goes onto a plinth, it may be possible to remove the plinth and take the saddle rack too. They avoid the soft leather of the padding to ensure no damage occurs in the process of stamping the letters. Synthetic saddles are engraved with the postcode onto the stirrup bar. Bridles are marked on the underside of the headpiece, where it fits behind the ears of the horse. Once stamped your details can be put onto a database which is used by police and other agencies, much like micro chipping, to reunite stolen goods with their owners. 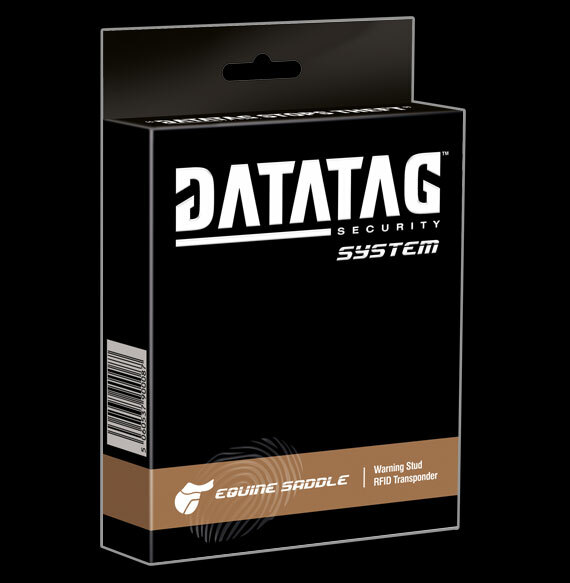 Datatag provides a simple to fit electronic ‘finger print’ for your saddle together with a warning decal for the tack room. You can also get microchipping kits which are Simple and quick-to fit, they contain a pre-loaded syringe with an RFID microchip. Using the same technology as is used for horse microchip implants, all trading standards offices in the UK have the scanners. The chip is implanted into the lower panel of the saddle on the right-hand side, and a permanent, numbered anti-tamper sticker is attached to the gullet of the saddle to indicate that the saddle has been micro chipped. This method has been a PROVEN deterrent to thieves . Once Chipped you can register your saddle on the national database. There are saddleries that offer to fit the service for you, alternatively you can purchase a DIY kit to do at home. The next layer is to look at the fabric of the building the tack room is in. Ideally a robust construction such as brick or metal, without windows. If the building is not robust then thieves will just go in through the wall and bypass any doors etc. Shipping containers are ideal tack rooms from a security point of view, as they only have one entry point, are a robust material that would require cutting tools to get in and have a metal door and no windows. Windows are a security weak point, so if your tack room has them the ideal solution would be to get them bricked up, if this is not possible, then consider putting bars on the inside of the window, or boarding up the window with wood. The next point to consider is entry and exit points, from a security point of view the fewer the better. All doors on the tack room should be outward opening and fitted with security hinges, as thieves will not think twice about removing the door. Again the perfect solution is an outward opening steel lined security door with security hinges, however these are very expensive. A cheaper alternative is fitting sheet metal to the back of your door, for an added layer of protection. At the very least you want to have a very thick sturdy wooden door, outward opening with security hinges. Looking at the lock on the door is also very important, not all locks are considered equal. Many insurance companies specify that at the very least the door must be secured with a 5-lever mortice deadlock, some also have clauses about the windows too, and again specify that the room has steel bars or steel grids on all windows; or Large metal containers that cannot be removed and are suitably locked. Some companies also base the excess you have to pay on whether there are visible signs of forced entry, so if someone else leaves the tack room open and your tack is stolen, it could result in you paying a greater excess than if the tack room has been forcibly broken into. It is worth having a look at your lock and checking your policy. There is nothing worse than having something stolen, only to find out it is not covered by insurance due to the wrong lock, or a door being left open. 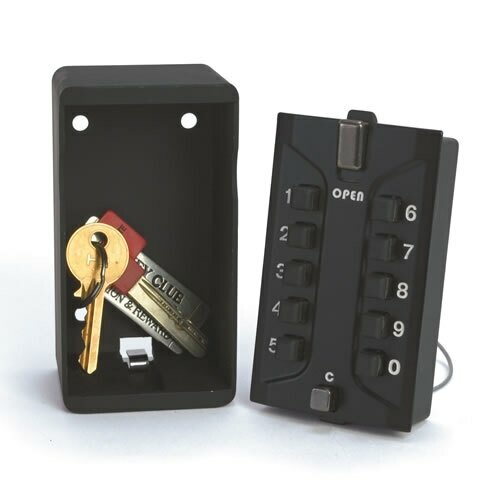 If you are using a key lock on the tack room door the key must be kept in a secure place when not in use wall mounted key safes, secured by a code are good for this, especially if the tack room is shared by lots of people, as it cuts back on the amount of keys needed. Make sure the code is changed every time a livery moves yards though, and also ensure there is a spare key to hand, in case it gets lost, or someone accidentally takes it home. An alternative to keys is using a Push Button Code Lock on the door instead. These are good because you can change the code if someone leaves the yard or you have to give to someone for a one time access use, then it can be changed again for security. However be sure to check with your insurance company that this type of lock is approved by them. The next points to consider are what you can add as extra deterrents, things such as security lights, CCTV and alarms. These are all proven methods to deter thieves. You can get motion sensor solar security lights cheaply off the internet, these require no electrical source and are very easy to install. Another company offering rural security solutions are Alarms for farms who have the GSM Stable & Tackroom Alarm which is Ideal for remote stables and tackrooms, and for use where no mains power is available. A GSM-enabled Stable / Tackroom Alarm incorporating a GSM control panel and a selection of internal security sensors. The receiver and GSM dialler are located somewhere reasonably secure and dry (usually in the roof of the tackroom), and the PIR sensor / transmitter is located in the area to be protected (also, usually the tackroom). The system is armed and disarmed either by text message or a remote control keyfob on on a pre-programmed schedule. Once armed, any intrusion will trigger the system and cause text messages and voice-calls to be sent to up to ten phone numbers. The system also has an output for an external siren which will serve to frighten the intruders off. This is especially useful if you don’t want to confront intruders, or if you live some miles away and are not in a position to respond rapidly. Additional sensors can be incorporated into the system to protect a wider area. To protect areas outside the stable block, external infra-red beams can be deployed at gates and vulnerable stretches of the perimeter up to a kilometre from the control panel. They also offer the Tackroom Alarm, which is a simple hardwired tackroom alarm with a built-in keypad for arming and disarming, a switch to select silent operation if required, and an external siren to provide a powerful deterrent. Supplied with magnetic contacts for two doors, so one can be used on the lower-half of a stable door. No mains power required, as the alarm runs on its own internal batteries. Finally as mentioned a few times above insurance. You can usually add on your tack to your horses policy, however check the stipulations very carefully as some companies do not replace like for like, and some also require the purchase receipts, again check the incidences which could occur where your tack may not be covered, or you may have to pay an extra excess, for example someone leaving the door unlocked/open. Again also check that your tack is covered at shows, and if so, what are the clauses- must it be locked in your car? or is a tack locker OK?? If you do not feel comfortable keeping your tack at the yard you can always take it home with you, some household policies will also cover tack, so it is worth checking with your provider there as well. If you are going to keep your tack at home we have a brilliant Travel bag that is designed to hold a full set of tack, as well as the accessories including your hat, gloves, saddlecloth, boots etc it even has a chiller pocket for keeping drinks or therapy boots cold, and comes with a removable trolley. It is perfectly designed to use for transporting all of your equipment safely and easily.